and sometimes I get e-mails about projects that artists have created after watching the videos. I absolutely love hearing from those who have watched the videos and I totally enjoy seeing what they have created. Today I wanted to share with you what they have kindly shared with me (with their permission). 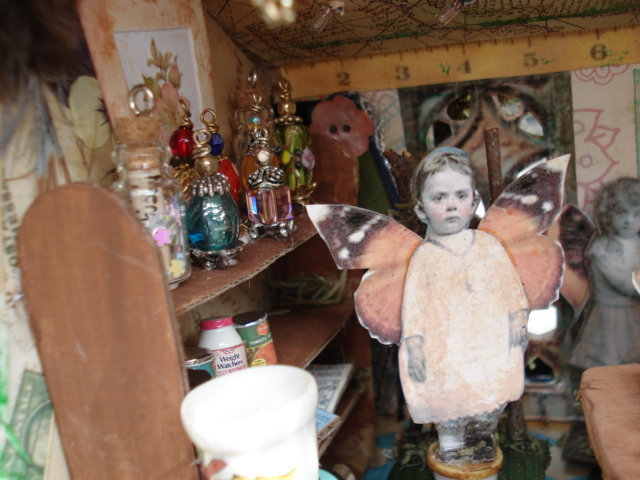 telling me how much she enjoyed creating her Fairy School house. Here is an excerpt from her e-mail. "...This schoolhouse took me almost 6 months to make. Since I live near a forest, I gathered my own moss and cleaned and dried it for this project. I still am adding little things to it, but wanted to show you, what I've completed so far. 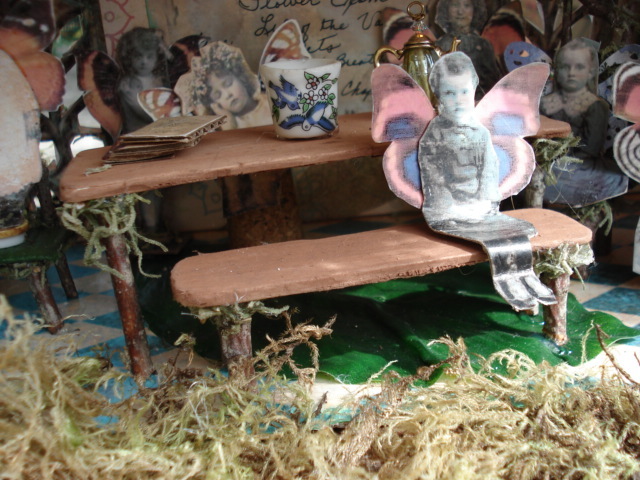 I made little chairs, a table and benches, a shelf to put little potion bottles, canned goods, maps & books...I had so much fun and enjoyed taking my time to make it." What a amazing school it is too! Here is a tiny student standing on a spool, next to a shelf full of all kinds of interesting items! Are they not magical fairies??? Thank you Carmen for sharing you creativity with me and for allowing me to share on my blog! I love your "natural" approach to your project, and all your magical creative touches! Barbara Mintmire sent me this picture of a group of beautiful shoes! 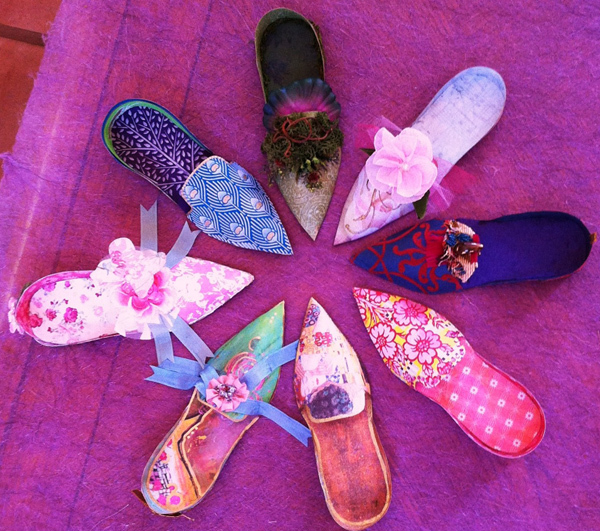 "My friends and I spent most of the day making paper shoes and crepe paper flowers based on your tutorials. We had a blast designing, cutting, gluing, etc., with breaks for a potluck lunch and later for dessert. Thank you so much for sharing the fun! I’m attaching a photo of our shoes." Thank you so much Barbara for sharing your creative group fun! 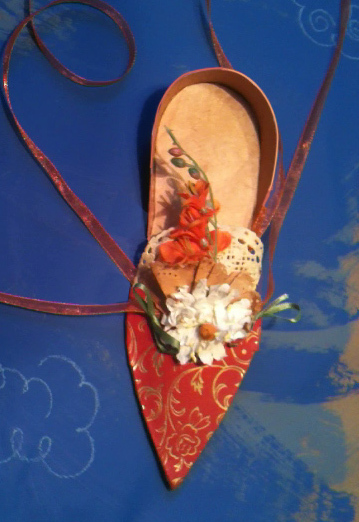 Here is a beautiful paper shoe made by Amy Bryant Kelly. She was very kind to send me this image and an explanation of her shoe..."This is part of a graduate project for a friend". 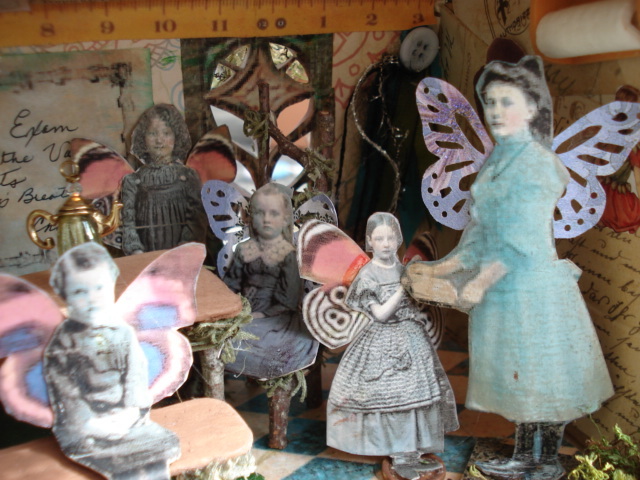 Amy has used some handmade papers, and created beautiful embellishments! Gorgeous Amy! Thank you so much for sharing with me, and letting me post about it. I have been working on and off since summer on a new series for making mixed media jewelry...something I have a passion for! But as this year has been super challenging for our family, as you may have noticed, I have not posted near as often, or any videos.....boo hooo! I am keeping my fingers crossed for a really great 2013! 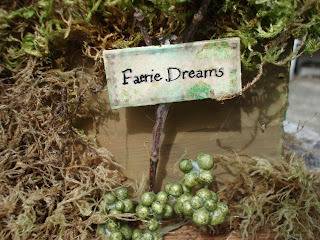 and maybe even a video series much more detailed about mixed media jewelry inspiration and creations. If you have not seen my tabs above with my free videos, why not check them out? The paper shoe video is almost at 20,000 views, not much by youTube standards, but really exciting for me! Absolutely incredible. Magical. I can see why it took her six months. It is a work of love. The detail is really something. Enchanting. 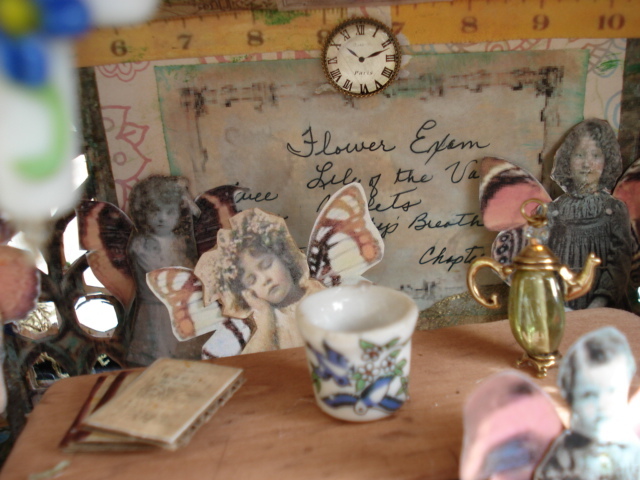 These are such beautiful creations inspired by your generous creative soul Terri Dear. May 2013 be a much better year for your family. This is the perfect post for me to say thank you for all the wonderful tutorials and inspiration Terri. Oh my gosh, that fairy school is incredible! I could look at those details all day. That fairy school is a thing of such beauty. What amazing creativity! Obviously a labour of love and all inspired by you, Terry. I also enjoyed looking at that lovely assortment of slippers. They are all so colourful and unique! Eventually, I plan to take the domino tutorial. I am so fascinated by those beautiful dominos you make. Take care! May 2013 be a wonderful year for you! Thank you for sharing these! The paper shoes are so pretty and that school house that Carmen made is absolutely adorable!! Oh I loved Carmen's little schoolhouse. It is darling! I think the shoes are all so lovely. I love how these artists share their own art with you Terri when they finish with your own generous sharing. You must get so much joy from them sharing it with you! Oh, I love the Fairy School House!! 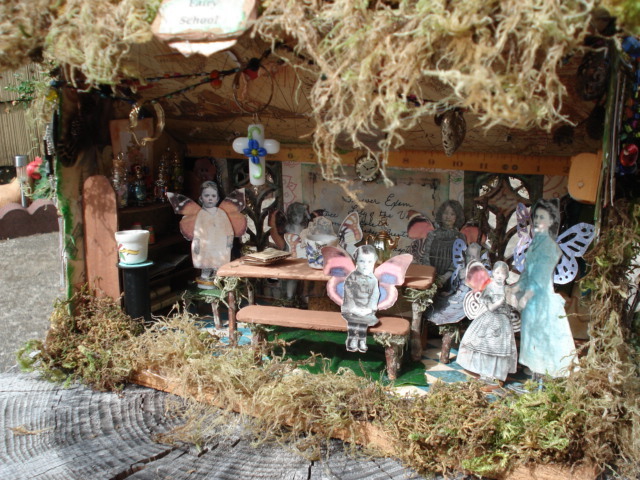 The Fairy school house is magical and so creative. What a sweet creative endeavor! It's so lovely to see your passions inspire others! These creations are so beautiful and such a wonderful reflection of your creativity! I love seeing the talents of others, these are amazing! what wonderful projects, you have so generous inspired to.The school house is adorable, and all the shoes so lovely and pretty. 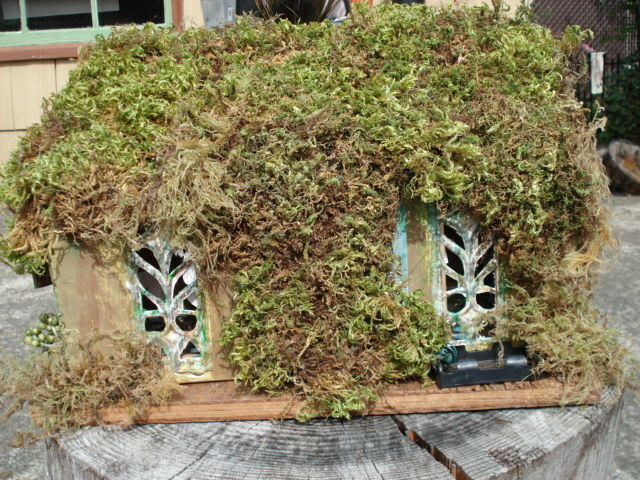 What a dear little Fairy School House - so much detail and immagination! Such a variety of gorgeous paper shoes too! Gee Terri how so rewarding for you to receive this fantastic feedback in appreciation for the wonderful tutorials you have put together for bloggers. You are so very creative and inspirational to so many! I look forward to your jewellery tutorials next year whenever you get around to them. Thank you for such a kind comment on my Giveway post. I wish you all the very best of luck! Oh my, that fairy school is SO enchanting!!! WOW! The slippers are gorgeous too. Thank you for sharing your tutorials and some of the inspiration you have given others. Hi Terri! Wow..what a beautiful post..Carmen did a gorgeous-fabulous job..i love the table and bench..really enchanting! It must be wonderful for you..to see others create magic..from your special inspirational art-tutorials! And LOVE the shoes from Barbara..fabulous and colorful! Shine on..a beautiful journey here today..full of magic and inspiration! Well, Carmen has certainly done a job well worth every minute of the six months. I even noticed that these faeries have a sweet little cross. How very spiritual of them. I love the way the teacher is working diligently with one of the students too. Detail is key and Carmen has it down. The shoes/slippers are of course incredibly delicate and lovely. In fact, I love all of your tutorials and have enjoyed making whatever you have to offer, Terri! I did your domino book class and it is wonderful, I am hoping to win your gorgeous Christmas Tree Domino give a way book, its something I would treasure forever!